Barcelona are without a doubt the best club side on the planet at the moment. Some may argue that they are one of the greatest of all time. In Lionel Messi, they have a player who will likely join the likes of Pele and Diego Maradona in the debate on who is the greatest player to have graced the game. Their style of football is viewed as the pinnacle to which all other teams should aspire. However, despite what some people may claim, they are not unbeatable. Whilst any side playing Barcelona will need some luck to go their way if they are to beat them, it is not an impossible task. However, they will need to be ultra-fit, tactical perfect and well organised. If they can combine these attributes, it is not infeasible for a side to overcome Barcelona. In this article, we will look at how exactly Barcelona play, then look at how you would counter their tactics and try and create some chances for yourself. We will use Ukrainian champions, Shakhtar Donetsk, as our example, given they will be the next side to attempt to stop the blue and red juggernaut in the Champions League. This first part will look at how to defend against Barcelona, whilst the second part will look at some attacking strategies to score the goals to beat them. In its most simple form, Barcelona’s formation is a straight-forward 4-3-3 with attacking full-backs. At their strongest, Gerard Pique and Carles Puyol would play as the two central defenders, with Dani Alves on the right of the defence and Eric Abidal on the left. Sergio Busquets acts as the more defensive member of the trio in midfield, allowing the two creative forces of Xavi and Andres Iniesta to get into more threatening forward positions. David Villa and Pedro play as traditional wide forwards, with Lionel Messi in the traditional number nine position. 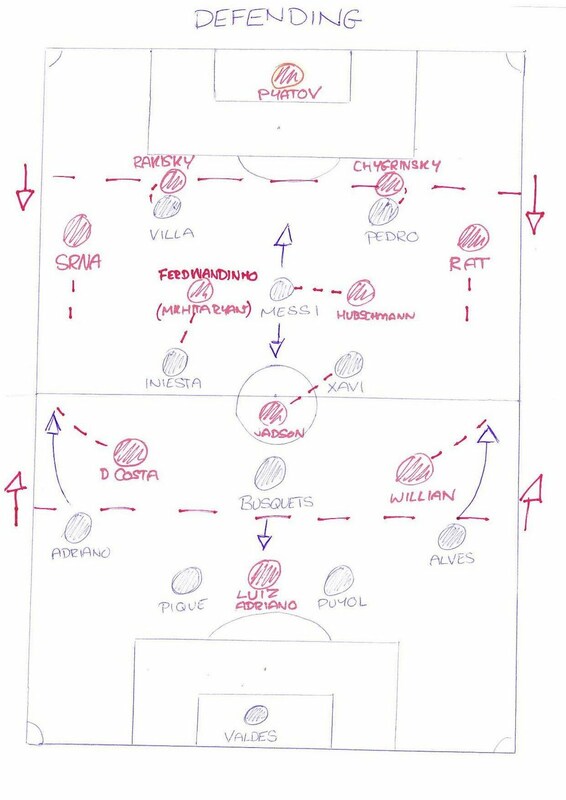 However, there are far more subtleties to how Barcelona play than just the simple rigid formation. Much of their play is based around a high pressing system, where they place severe pressure on the player on the ball, even back in the opposition’s defensive third. Whenever an opposition player receives the ball, two Barcelona players converge on them. This often results in teams struggling to get out of their own half and Barcelona get the ball back in already attacking positions. Despite playing with two wide forwards, much of the width is provided by the two full-backs, who often tend to play as though wingers, rather than defenders. They push forward in almost every attack, whilst Sergio Busquets drops back to make a defensive three to cover. The space for them is created by David Villa and Pedro, who drift inside to drag the opposition central defenders and full-backs narrower, leaving space to exploit on the wings. The role of Lionel Messi is also an interesting one. Despite starting as the central striker, he often drops deeper as though at the peak of a narrow diamond in midfield. This tends to drag one of the central defenders out with him, leaving space in behind for balls through to David Villa and Pedro. However, given his immense talent, you clearly cannot just leave him unmarked, so this is another headache for opposition players and managers. So now we have a brief idea of how Barcelona plays, how do you stop them? The first step is to play the right formation. Playing a traditional 4-4-2 formation as several teams have tried is simply not going to work. The two in the centre of midfield will struggle to cope with the trio in the centre of the Barcelona midfield, and it will cause chaos with Messi dropping deep to add to the mix. 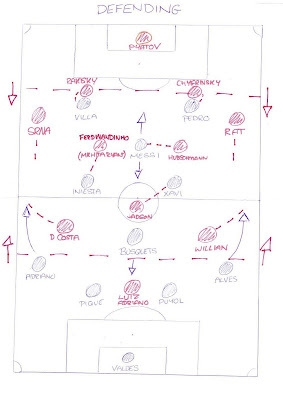 Similarly, this rules out a 4-4-1-1 type formation. In my opinion, the ideal formation to counter Barcelona would be a 4-2-3-1 type formation that can easily convert to a 4-5-1 when defending. Looking at the overall team instructions first, although a risky strategy, playing with a high defensive line, keeping the formation short and narrow would be a good place to start. Whilst it does leave the risk of Barcelona springing the offside trap and getting the likes of Villa and Pedro in behind, it does help to prevent Barcelona from finding the gaps in between the lines, which they love to play in. The likes of Messi, Xavi and Iniesta are masters at finding space between the line of four defenders and the midfielders, so by compressing the formation, it begins to cut out these spaces. It also brings the advantage that when you win the ball back, you are likely to find yourself in a more advanced position on the field. Another interesting observation came recently as Barcelona drew with Sevilla. Particularly in the second half, Sevilla adopted a very physical approach to dealing with Barcelona, going in hard, but fair, in the tackles. Barcelona were noticeable unsettled by these tactics. We even saw the usually calm Xavi squaring up to Medel in the centre of the field. Anything to unsettle Barcelona can only work to your advantage. Looking at Shakhtar, they have the experienced Dmytro Chygrynskiy, who had a spell at Barcelona before returning to his native Ukraine, and Ukrainian international, Yaroslav Rakitskiy. Chygrynskiy, whilst not being the quickest, is very good at reading the game, and he is complemented nicely by the more physically talented Rakitskiy. The two central defenders must be very disciplined in their role. It is important that they concentrate solely on the two wide forwards, David Villa and Pedro. If they are attracted to Lionel Messi dropping into the midfield, they will be dragged out of position, leaving a two-on-one situation against their partner, which Barcelona will invariably punish. The unenviable role of shadowing Lionel Messi must fall to the deepest of the midfield trio. In Shakhtar’s case, Tomas Hubschmann. He will have the role of man-marking Lionel Messi wherever he goes on the field, whether it be dropping deep into the midfield looking for the ball or running beyond Villa and Pedro into the heart of the defence. He cannot leave Messi to the central defenders or they will run the risk of losing one of the two wider forwards. The next important attacking threat that Barcelona possess is that of the full-backs, Dani Alves and Eric Abidal. For me, it is important that the wingers are responsible for picking them up, rather than trying to leave them to the full-backs. Villa and Pedro will look to drag the full-backs inside, helping to cover for the central defenders. If they are also responsible for marking Alves and Abidal, they run the risk of leaving them unmarked. Instead, if the two wider players of the three more attacking midfielders are responsible for tracking Alves and Abidal back, it ensures they are covered at all times and your own full-backs are free to cover back and help the two central defenders. In Shakhtar’s case, it would fall to Willian and Douglas Costa to track Alves and Abidal. Whilst both of these players are better going forward, they must maintain their discipline and track back. Nobody is necessarily asking for them to be making inch-perfect tackles. Merely covering the full-backs will help to cut out a key part of the Barcelona attacking options. 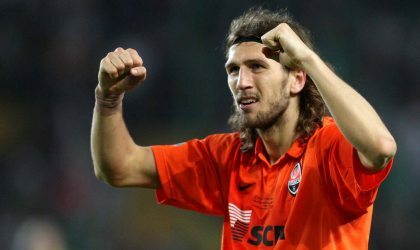 It would also allow the hugely experienced pair of Shakhtar full-backs, Darijo Srna and Razvan Rat, to drop inside to provide the cover for Chygrynskiy and Rakitskiy. Next, the other two central midfielders have an important role. They are responsible for pressuring the creative hub of Barcelona - Xavi and Andres Iniesta. These are arguably the two most important players for Barcelona, despite the talents of Lionel Messi. They are masters of passing and moving, and are quite happy to receive the ball under pressure. However, putting them under constant pressure is vital. Give them time and space and they will undoubtedly punish you with through balls, balls clipped over the top, or majestic dribbles. Playing with a high line will help to confine the space that they have, but keeping two players pressuring them at all times will restrict what they are capable of doing. Despite all their talent, they are still only human, and under heavy pressure, they will be far less able to produce the moments of magic and set players away. In Shakhtar’s case, Ferdinandinho would be the best option to track the more attacking Andres Iniesta, whilst either Jadson or Henrikh Mkhitaryan would be his partner to pressure Xavi. This leaves the single striker, most likely Luiz Adriano, the thankless task of trying to close the ball down in the Barcelona defensive third. Sergio Busquets, Gerard Pique and Carles Puyol are all comfortable on the ball, but if these three are playing the ball around the back, you would be relatively happy. You will never stop Barcelona having the majority of the possession, but it is all about where they have the possession. Allowing them to pass the ball around in their own half gives the defenders a brief moment of respite, then pressing hard when they try to come forward. 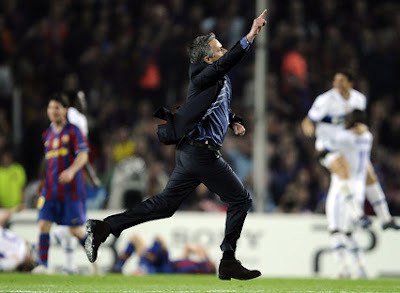 Jose Mourinho’s ten men demonstrated this to perfection in restricting Barcelona at the Nou Camp last year. They put virtually no pressure on the ball until they reached the attacking third of the pitch, when they gave Barcelona absolutely no room on the ball whatsoever. It resulted in a ridiculous possession statistic where Barcelona had 76% of the possession and every Barcelona player, including Victor Valdes, made more passes than Javier Zanetti, the Inter player who completed the most passes. However, most of these passes were not in dangerous areas, so Inter were happy to let them pass the ball in front of them.